"The Theory of Everything" is a new film about astrophysicist Stephen Hawking and his first wife, Jane. Famed astrophysicist Stephen Hawking changed cosmology with his ground-breaking work on black holes and the origin of space and time, but his personal life has stayed mostly out of the limelight. Until now. 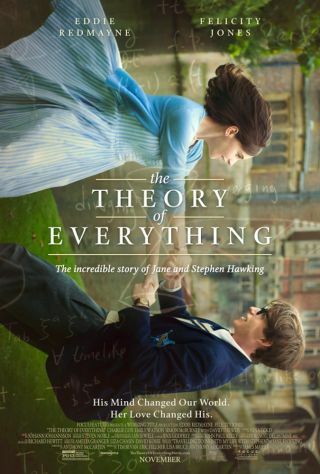 The new movie "The Theory of Everything" is based on the memoir "Travelling to Infinity: My Life with Stephen" (Alma Books, 1013), written by Stephen's ex-wife Jane Hawking. The film focuses on Jane Hawking's courage and determination to support Stephen Hawking, who was diagnosed with a type of motor neuron disease when he was 21. His mind remains undamaged, but the disease has destroyed most of his voluntary muscle control. "I didn't want it to be a science movie," McCarten told Space.com. "We don't want to see endless equations; we want a story." But that didn't mean they left out all the physics. The director, James Marsh, said the film crew included an on-set physics adviser. Marsh and McCarten knew that, ultimately, Hawking and other physicists would see the film, so they wanted any science and math presented in the movie to be accurate. "I wanted to honor his great discoveries," McCarten said. "There was never a deal where we get rid of some of his discoveries because we're not interested. They had to be there, but they had to be cinematic and entertaining." McCarten said he always knew the film would have to be three stories in one: a science story that explores the origin of space and time, the horror story of Hawking's physical decline and the love story between Stephen and Jane. The movie is focused mostly on Hawking's personal life, but a few broad physics and cosmology themes are woven in. The idea was to keep the physics to a level where people could grasp the general nature of the ideas without needing to understand any of the details or complicated mathematics behind them. "I decided, at some point, the trick would be, don't have a scientist explain the science," McCarten said. "And so you would be forced to use layman's terms and, more than that, forced to use objects lying on the table to try and explain quantum mechanics." Still, audience members will not come away with much of an understanding of Hawking's discoveries and theories. "Physics and movies don't really go together so well, and a dramatic film is not really the best place to discuss theoretical physics," Marsh said. While directing the film, Marsh drew inspiration from anecdotes used to explain science, like Isaac Newton being hit on the head with an apple (gravity) and Archimedes jumping out of the tub naked and yelling "Eureka!" (Archimedes' Principle). McCarten wrote the script before he ever approached Hawking about the movie, so the physicist had little input in the film. However, Hawking did come to the second day of filming. Actor Eddie Redmayne, who plays Hawking in the film, said the pressure that day was incredible. The crew was filming a scene where Stephen and Jane watch a fireworks show at a school dance at the University of Cambridge. "You saw this silhouette of him in his chair coming down, flanked by nurses, and his face was uplit by his computer screen like a kind of spotlight on his face. And then, as if on cue, the fireworks went off," Redmayne said. "And it was like the greatest entrance I have ever seen." The movie is sparse on physics and cosmology, but provides a window into parts of Hawking's life that most people are not familiar with, McCarten said. "He loves life, and that's kept him going," McCarten said. "If there's a secret to the guy, I think it's that." "The Theory of Everything" is in theaters now.